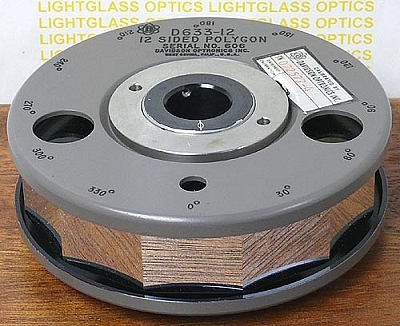 The Davidson Optronics D-633-12-2 1 Arc Second Optical Polygon is a 12-sided polygon, made of a solid piece of fused quartz. This is highest accuracy model, and each face is mirrored and overcoated, with a face flatness of 1/5 fringe. Compact and lightweight, this polygon features 2 ports so you can use a autocollimator to precisely position the mounting axis. Since this is made from one solid piece, it will be accurate tomorrow, next year, or the next century! This is priced at 60% of new and comes in its fitted factory mahogany box.